This early 19th century three-arch hump back road bridge over Straide river was bypassed in the early 1980's. It is made of local fieldstone offset by limestone dressings. The bridge is visually attractive and is well constructed. It is an important component of the civil engineering heritage of Straide. A discreet benchmark adds additional interest with its association with the preparation of Ordnance Survey maps. 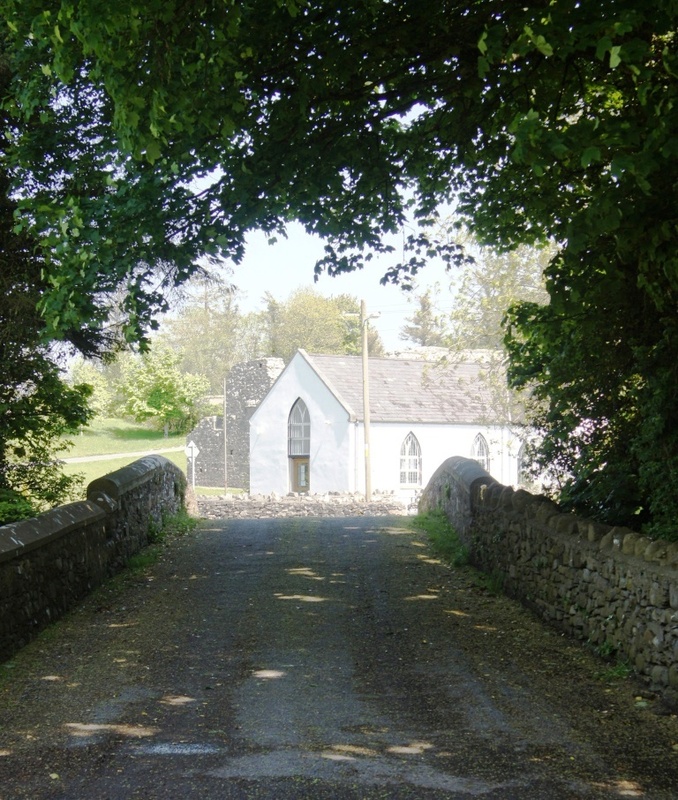 The bridge leads to the what is now the Michael Davitt Museum, formerly the parish church. Straide, Co. Mayo like so many parts of Ireland has a rich history. The river Moy provided the easiest access route for the earliest settlers. Each wave of newcomer both fitted into the community and also brought outside influences, some of which were adopted. A wealth of evidence about the people of Straide lives on in the landscape. Some past monuments are hidden and other in ruins. These sites are an enduring reminder of the previous generations who laid the cultural foundations of Straide. The wedge tomb in the townland of Knockshanvalley is evidence that people settled here from early times. These tombs generally date from the Bronze Age or earlier (2500 BC to 1800 BC). Ringforts are common in the Straide landscape and are tangible evidence that Straide was well settled in the early Medieval Period (AD 400-1100). The Anglo-Norman Invasion of the 12th century saw the building of one of the first and largest baronial castles in Mayo at Ballylahan in mid 13th century. It was strategically located on a fording point on the river Moy. Straide Abbey (Friary) was founded a few years later becoming home to the two great European orders. It was firstly a Franciscan Friary before being transferred to the Dominicans a few years later. It is named Priory of the Holy Cross and is known locally today as Straide Abbey. It was a daughter house of the Sligo Dominican friary which had a relic of the True Cross. An archaeological excavation took place in the vicinity of the Abbey in the 1990s. This revealed a glass making factory was once active on the site in medieval times. Glass making had spread across Europe from the 12th century in response to the desire for glass in medieval abbeys and friaries. The political and land upheavals of the 16th and 17th centuries heralded in a new system landlord systme of landownership. The homes of the landed gentry are a reminder of this time. In Straide the landlord’s houses were relatively modest. Ashbrooke House, constructed in the 18th century was home to the Moore’s, later of Moore Hall. Straide was an important trading centre obtaining a patent for markets and a fair in 1651. Fairs continued to be held here up to the 1940s. The old Catholic church dates from the early 19th century. It remained as the Parish church up until 1916 when the new SS Peter and Paul church was consecrated. 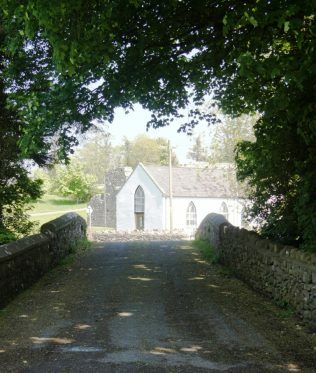 For a period in the 20th century the church was used as dance hall and parochial hall. In the late 1990s it was restored by the Office of Public Works to its original T-plan cruciform in shape. It has been home to the Michael Davitt Memorial Museum since 2001. Michael Davitt (1846-1906). the internationally renowned statesman and Mayo’s Most Famous Son was born in Straide. His family was evicted from their home when Michael was a child. They immigrated to industrial Lancashire, England where Michael began working in the textile industry at a young age. He lost his right arm at age 11 in an industrial accident. Through his subsequent education he became interested in Irish history and in 1865 he joined the Fenians. He was later sentenced to 15 years for treason felony. On release, he toured extensively, founding the Land League in 1879. The campaigns of Boycott, the Ladies Land League and the ’No Rent Manifesto’ were cornerstones of the Land League campaign. Later in life he became an MP, travelled extensively and wrote books and campaigned for the rights of minorities, disadvantaged and the down trodden. He died suddenly in 1906 and was brought home to Straide for burial. A commemorative monument and plaque was erected on the Fair Green in Straide in his honour for the 100th anniversary of his birth. He has inspired such world leaders as Mahatma Gandhi and Nelson Mandela.